Though I'm able to gleen most of the pertinent information from this 1876 marriage record of my g. grandparents, I'm having a difficult time with the specifics, especially dates and ages. A proper translation would be most helpful and a joy to read in its original meaning. I will be most grateful..at your convenience. Thank you! Please find attached the German as well as the English version of your document. kraft des Gesetzes für rechtmäßig verbundene Eheleute erkläre. In the presence of the witnesses the registrar put to each of the betrothed in turn the question: whether they were willing to enter into marriage with one another. The betrothed answered this question in the affirmative, whereupon the registrar pronounced that by virtue of the Civil Code they were henceforth legally joined in marriage. The accordance with the main register is approved. Waitzenau on July 4, 1876. The Registrar. Stoike. Michael...this is extremely helpful and I am VERY greatful for your wonderful translation! Thank you! Still working on Clara Elisabet Blase from my last posting a few weeks ago. I now see that this is a blended family. Clara and her first husband. Clara and her 2nd husband. Then the 2nd husband and new wife after Clara's death. 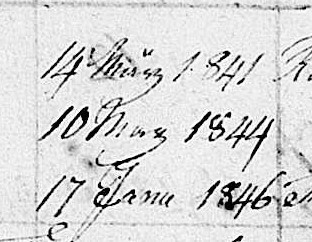 All on the same church family register page. I've added a couple pictures. Picture one is Clara, with her first husband. Is it Gerhard Heinrich ________ ? This is the most important thing I need, his surname. Picture two is the list of witnesses/sponsors for this family. I believe some are given names only, some are given and surnames. I'm sure knowing some of these will give me good clues where to go next. If this list/picture is too small, I can cut the list into halves and post two pictures of it. Picture three is birth dates. Are the first two March or May? And the 3rd is January? Thanks again for your help. It is very much appreciated. It is always difficult with names but I will have a try. The first picture shows what I read as „Johan Heinrich Altengarten“. Clara’s name is written „Blasen“. The third picture gives the dates as „März“ (March), „May“ (it was quite common to use the letter „y“ – often with two dots on top – instead of „i“) and „Janu[ar]“ (January). I am hoping someone can translate the details of this marriage document. It should contain the details for a friends grand-parents marriage. First I must say many thank yous for your wonderful work. 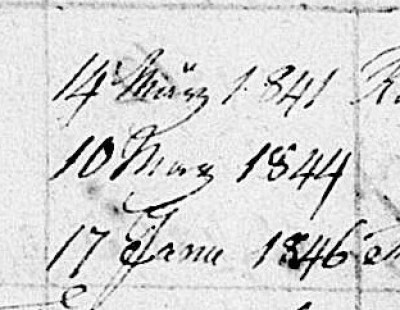 As a volunteer transcriber with FREEREG here in the UK I have donated over a half million baptismal records for 19th century Norfolk County churches and never expected to be bamboozled by a 20th century document - even one from Poland. There are a couple of minor discrepancies with the transcript- from this couple's son's UK naturalisation papers we know his father was "Piotr" or "Peter" and the family name is Przyborski rather than with the "s". Quite understandable given the handwriting style. The son of this couple was Teofil who escaped the Nazi invasion to make a new life in England. 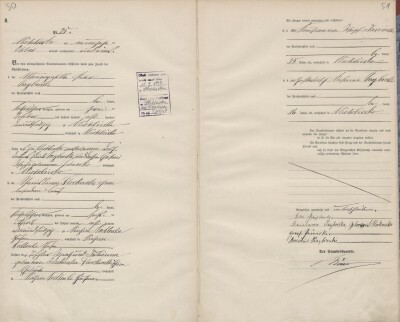 He was born in Podlesie Koscielne on 12th December 1903 as per the attached document. I am wondering if this is the same place as that deduced for Stanislavia's residence in the Marriage? 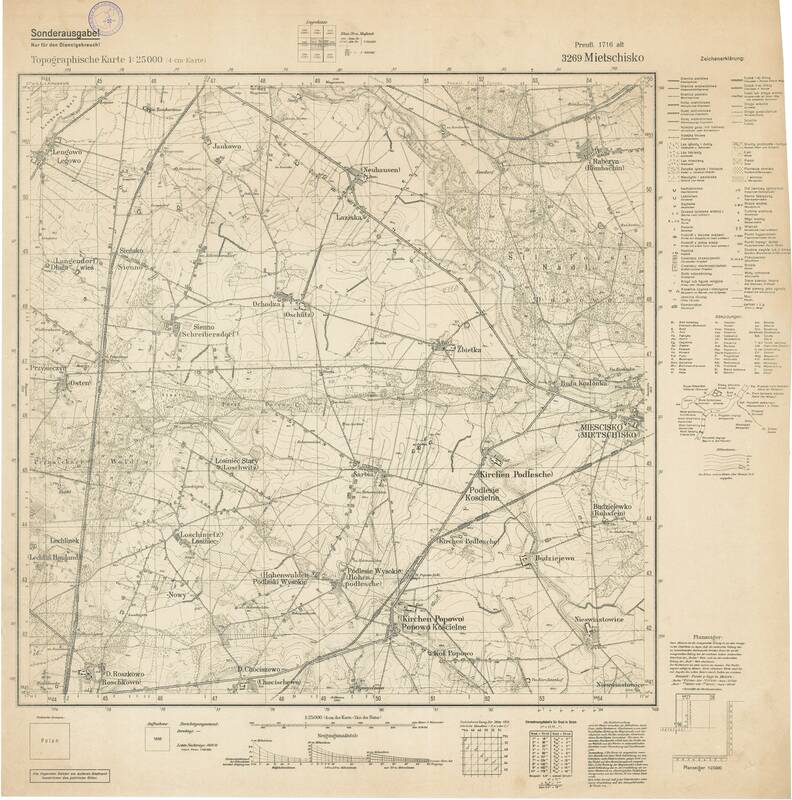 There were two administrative units: Kirchen Podlesche Gut, having 159 inhabitants in 1910, and just a stone’s throw away Kirchen Podlesche Dorf, with 54 inhabitants in 1910. A “Gut” or “Gutsbezirk” had no local council and was represented by the landowner, whereas a “Dorf” or “Gemeinde” was represented by a local council. When she married, Stanislawa lived in Kirchen Podlesche Gut and obviously later moved to the village, where she gave birth to her child. It looks as if the registrar in 1903 combined German and Polish names when he wrote Kirchen Podlesie Dorf. Thank you again Michael for the map that clarifies the situation and places them all in the same area. 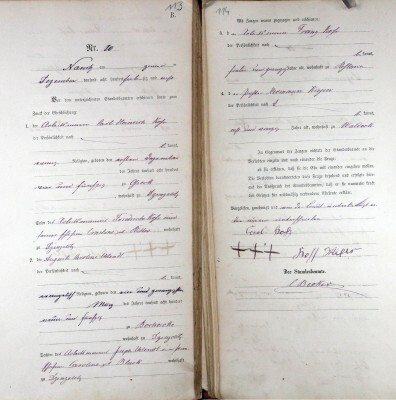 Our next step will be to start looking for Peter Przyborski and Stanislavia Florkowska in baptismal records. As well as the two marriages of the respective great-grandparents. Such is genealogical life for every problem resolved two more opportunities appear. Thanks you indeed for your help. 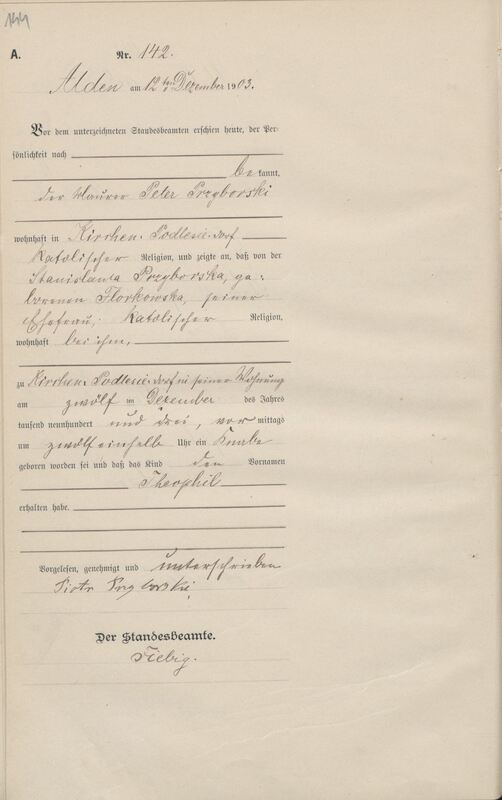 Is anyone who could translate German text, which is about my great grandfather Theodor Moczygiemba. 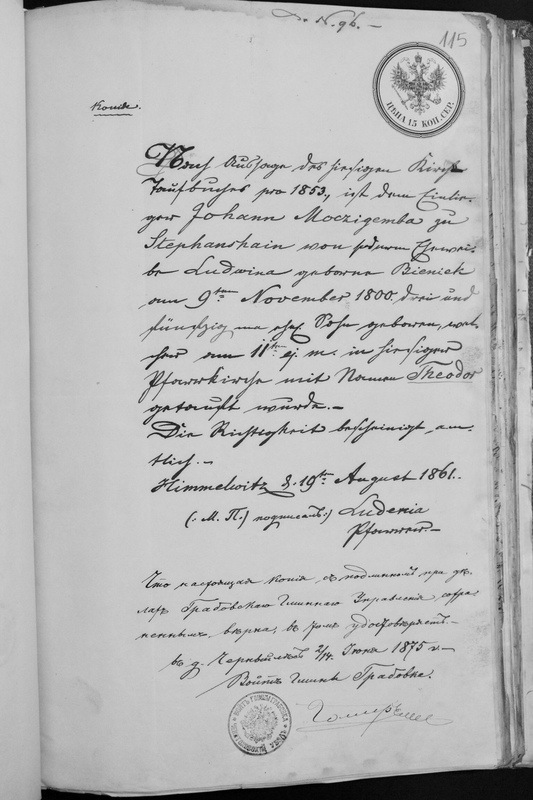 According to the local church baptismal register of 1853 on November 9, 1853 a marital son was born to Einlieger (farm laborer) Johann Moczigemba residing in Stephanshain from his wife Ludwina born Bieniek, and was baptized Theodor on November 11 in the local church. Can anyone translate this for me. It's for my Great Grandmother Marie Pokorny. She married my Great Grandfather Jan Grzyb who was from Swiecany and they lived in Ostrava where my Grandmother Hermina and her Brother Stefana were born before coming to the US. Not much was known about her. Was said she was orphaned and spoke with a Bohemian accent and had a German prayer book. Trying to determine if this a birth certificate or if there are any clues that tell me where she is from. 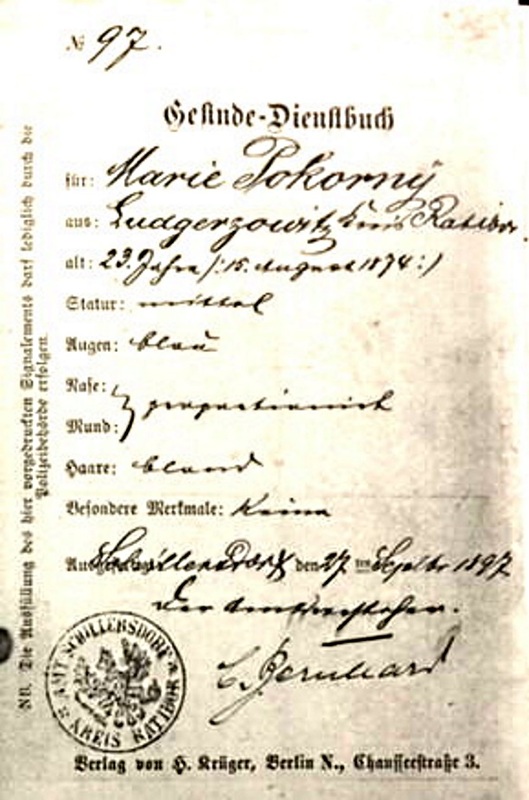 This document is the first page of the Gesinde-Dienstbuch for Marie Pokorny. 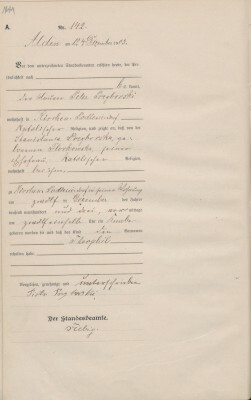 According to the Gesindeordnung (servant’s law) someone working as a servant had to provide this Dienstbuch (register of service) when he or she entered into service. When leaving the service, it was returned to him or her with a statement on his or her conduct and behavior. 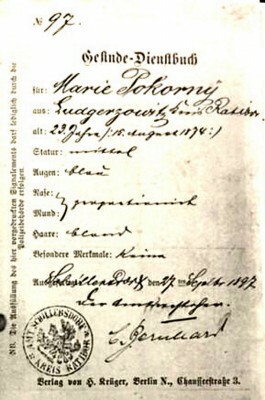 Marie’s register of service was issued in Schillersdorf, Kreis Ratibor on September 27, 1897. Besondere Merkmale: keine (specific features: none). Whether Marie’s place of residence was also her place of birth is not provided in the document, but it might be a good starting point. It’s today Ludgeřovice in the Czech Republic (49° 54′ N, 18° 15′ O). Schillersdorf is today Šilheřovice in the Czech Republic (49° 55′ N, 18° 17′ O). 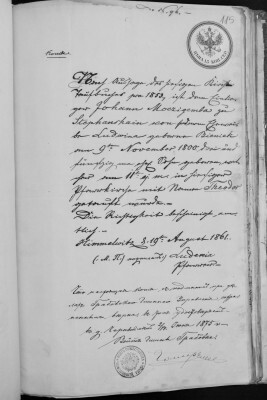 Hi, can anyone translate this document for me? 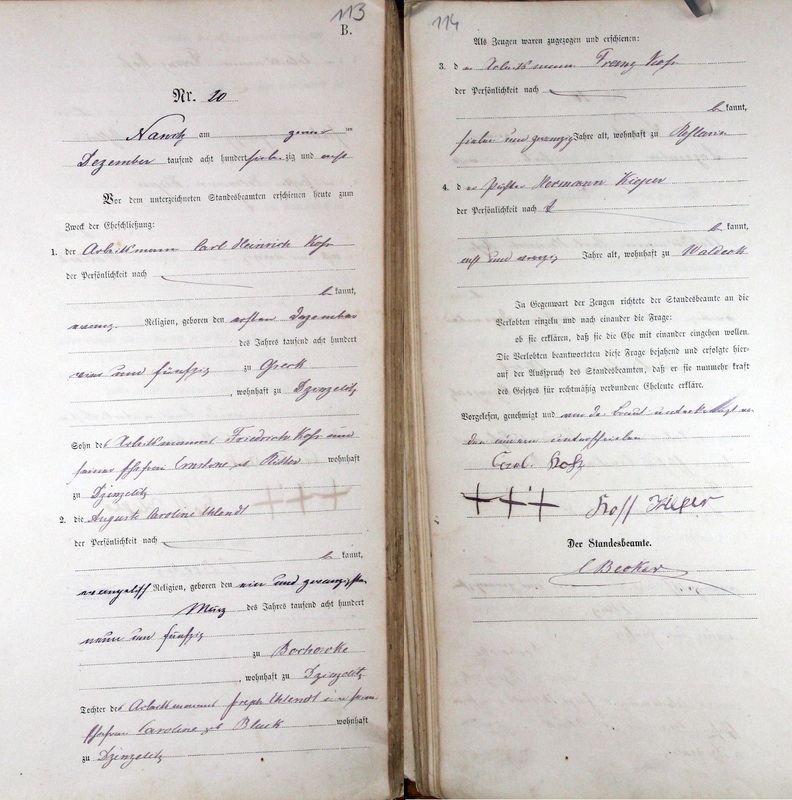 It is the marriage record for my Great Great Grand Parents Carl Koss and Auguste Ehlendt. 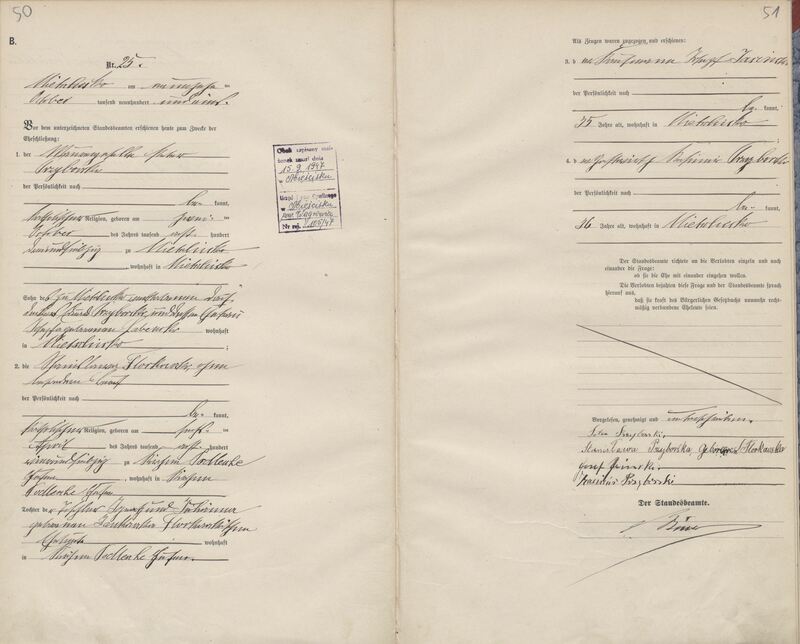 Please find attached the translation of the marriage record.